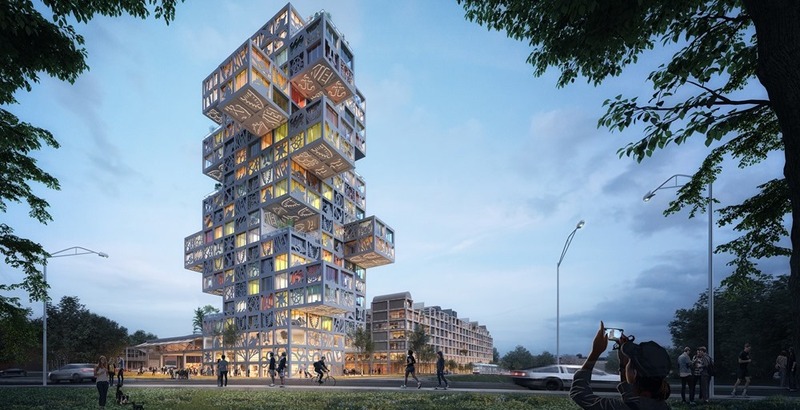 Long-time REVITALIZATION readers are by now well aware that the Rotterdam, Netherlands-based design firm MVRDV has made a specialty out of revitalizing run-down office buildings and commercial districts into green, mixed-use neighborhoods. Now, they’re at it again, only this time with a fallow industrial—rather than commercial—property. 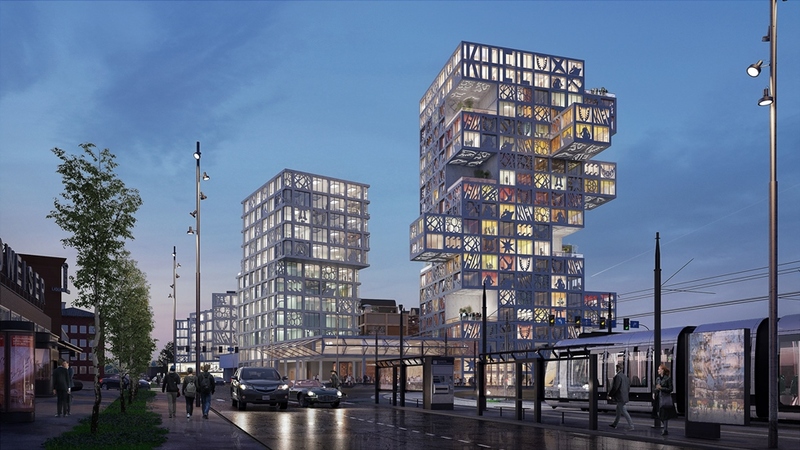 On January 25, 2019, MVRDV was selected to be the designer of a 65,000-square-metre mixed-use complex that will redevelop a post-industrial site in Kiel, Germany. Dubbed “KoolKiel”, the proposal is located in a formerly industrial area in Kiel, near the southernmost tip of the Kiel Fjord. Currently, it’s occupied by a large, single-story building, originally used for storing chains for ships. However, in more recent times, this structure has become more notable for its connection to Germany’s famous Werner comics, which were printed in the building from the early 1980s. The building is now known as W8 Medienzentrum, and is home to a variety of companies working mostly (but not exclusively) in media and the creative industries. This collection of tenants has given the area a unique and charismatic identity, which strongly influenced MVRDV’s subsequent design. 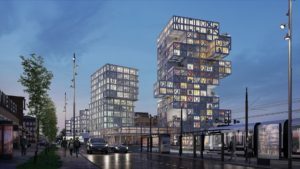 The proposal calls to retain the existing structure of the W8 Medienzentrum as commercial units, topping it with apartments. 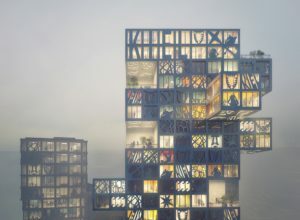 Next to this, a new building is proposed with a zig-zagging plinth containing offices and shops, topped by several cubic blocks of housing, and a tower of office spaces. At the end of the site, a 250-room hotel tower connects to the aforementioned plinth through a public event space, which will be used to host exhibitions and events organised by the community. Lively exterior spaces are key to the project: a courtyard between the buildings is filled with a variety of street furniture for the residents to occupy, while a rooftop park snakes its way around the three cubic blocks of housing. The project’s most eye-catching element is the façade panels, made from fibre reinforced concrete, which sit in front of the window and display a variety of icons inspired by the creative output of the locals. However, within this arrangement, the design proposal includes many opportunities for community input. By considering the design not as a fixed concept but as a flexible system, the building as it is eventually constructed might fall anywhere on a spectrum of options, from a conservative series of boxes to a wacky yet charismatic collection of cantilevers and iconography. This flexible design system includes options to change the size and number of cantilevers on the hotel tower, to change how much of the building is covered by pictographic panels, and to alter the size, number, and layout of apartments placed above the existing W8 building. All told, a wonderful new life is now envisioned for a part of Kiel that most folks have avoided for decades. All renderings are courtesy of MVRDV.